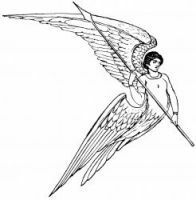 One of the earliest examples of Archangel Art can be found in the old church of San Michele at Ravenna. The mosaic in the apse exhibits Christ in the center, bearing in one hand the cross as a trophy or sceptre, and in the other an open book. 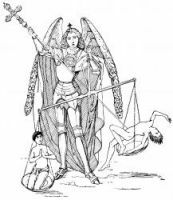 On each side stand Michael and Gabriel, two of the most well-known archangels, with vast wings and long sceptres. Their names are inscribed above, but without the Sanctus and without the Glory. 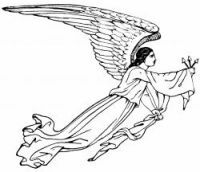 It appears that in the middle of the sixth century, the title of Saint, though in use, had not been given to the Archangels. 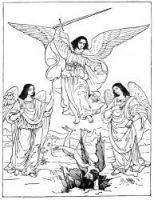 This collection of Archangel Art is from my an old book in my personal library. 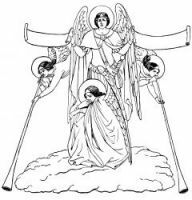 Click on an Archangel Art image below to see more details about saving a free piece of Archangel Art or about purchasing the Archangel Art at a higher resolution.